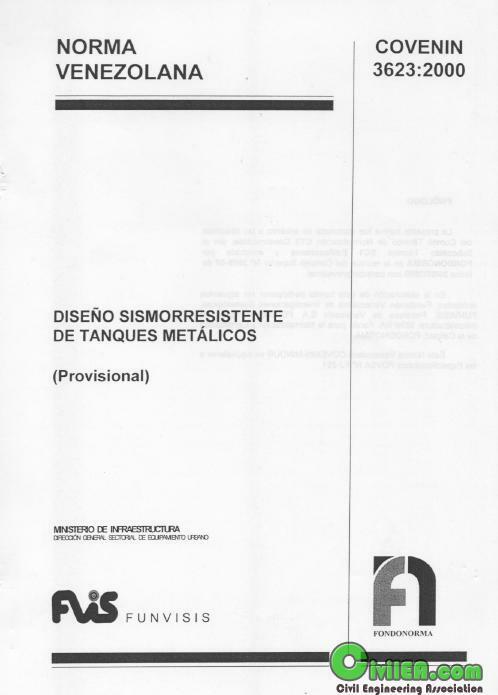 VENEZUELA - Seismic design of metallic tanks. This standard applies Venezuelan seismic analysis of industrial plants - oil and non-oil companies- such as cantilevered structures on the basis of reinforced concrete or steel, vertical vessels supported on a skirt or a support structure, fireplaces, furnaces, towers , silos and other facilities of similar configuration, essentially horizontal structures on foundations, columns or walls of reinforced concrete or steel drums, heat exchangers, pipe bridges, fields, air coolers. This Standard should be used in conjunction with COVENIN 3621 code. For application to a particular installation, it is required to know the geographical location, the degree of risk and the geotechnical characteristics of the site foundation.